Small bamboo plant transplanting is much easier than trying to move and plant larger bamboo plants. Bamboo grows very quickly given the right conditions, so it is important to transplant it while it is small and put it where you want it, as well as taking steps to ensure that it doesn't spread beyond. It is notoriously difficult to determine what kind of bamboo plant is growing in your yard if someone who lived there before you planted it. If you're planning to buy bamboo plants and transplant them into your yard, visit a reputable nursery-one that specializes in bamboo if possible-so you can find the best plant for your conditions. There are different kinds of bamboo that thrive in just about any conditions, from full sun to shade, in warm places and cool. There are more than 400 types of bamboo that are easily available in the United States and Canada. Odds are good that whatever types of bamboo are sold near you will grow well where you live. The garden center professional or the plant tags can tell you which variety would be best for your particular sun and soil situation. It's very unusual to actually find bamboo seeds. Bamboo plants tend to flower very rarely, sometimes only once every 50 to 100 years. The exertion involved in flowering often kills the plant. The most common way that bamboo is propagated is through transplanting. This is done by digging up part of a clump of bamboo and planting it elsewhere. Small bamboo plant transplanting is a great idea because small plants are much easier to move and handle. They are also less likely to be harmed when transplanted if the plants are small. Small bamboo plants grow very quickly, and you'll save a lot of money when you buy smaller plants. It is important to have a good site picked out that will work well for the bamboo variety you intend to plant. While established bamboo isn't very picky, new bamboo plants will want to be well-watered, have a little protection from the sun, and have a place where they don't have to compete with a lot of weeds. Most bamboos like acidic, loamy soil. You can add compost or other amendments to your soil if it is very alkaline or full of clay. If the bamboo has been growing inside before you are ready to plant it, it makes good sense to "harden off" the plants before transplanting them outside. This is a process by which plants are slowly acclimated to the outside temperature by being left outside in a protected place for longer and longer periods of time over the course of a week or so. Once the plants have spent a day outside in their pots, they can safely be planted. This step isn't necessary for bamboo that has already been growing outside, but it will make for much healthier, stronger plants if they've been raised indoors. Bamboo can be planted any time of year in mild climates, but if you live somewhere with cold winters you should do your small bamboo plant transplanting once it has warmed in the spring so they have plenty of time to get used to being outdoors before winter comes. 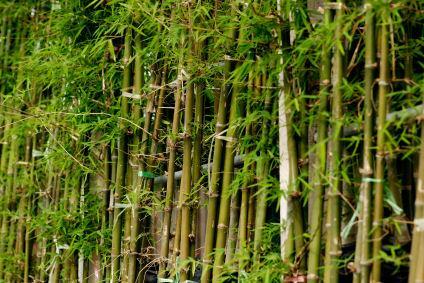 When you plant your bamboo, make sure you install a plant barrier that is about three feet tall and at least 40 millimeters thick in the ground to ensure it doesn't grow where you don't want it. You can also dig a three-foot-deep trench and add gravel or concrete to the pit to block the spread of bamboo. You'll probably want to rent a trench-digging machine for this purpose. Bamboo appreciates a thick layer of mulch. Organic material is the best choice for mulching, from grass clippings to dry leaves to your own compost. Allowing the bamboo leaves to fall and decompose is helpful as well. New bamboo plants need a lot of water. According to the American Bamboo Society, plants that were grown in containers smaller than five gallons need a gallon of water twice a week, more often if it's very hot and dry. Larger plants need even more water. Once established, bamboo plants do not need a lot of care. They will grow just fine without fertilizer and regular waterings, but if you want to see your bamboo grow very fast, both fertilizer and water will help. Some bamboo plants have been known to grow as much as a foot a day under ideal conditions, but don't get worried if yours doesn't show this type of growth right away. Sometimes new plants will take up to two years to really get growing, but you will be richly rewarded with a plant that is beautiful and hardy.